• Private rides are available for the experienced rider...view rate options below! We had the best time ever. Everyone was friendly, helpful and kind. The horses were great! Our guides, were patient and helpful, ya man! The lemonade drink on the beach was refreshing. The photographer was great, she took wonderful pictures of us. The price was the best, the cruise would have charged us $20 more per person. Thanks for a wonderful time. From check in to driver to tour guides, everyone was friendly and helpful. We would definitely book again! We had a wonderful experience. Everyone was very courteous and friendly. The horse riding trip was amazing!! Our driver was great and the staff were very friendly. The horseback riding was very nice. The guide was informative and knowledgeable. Showed us leaves along the way what there purpose was and there interesting smells. Swimming a horse is really unique and fun. The Driver Sylvin was amazing! What a fun truly genuine guy. All went very well. It was a surprise for 3 family members who were visiting Jamacia and Celebrating my granddaughter's 21st birthday. They had a wonderful time and commented on the friendliness of the staff. Also, remarked on the fact that the horses were treated so well and taken good care of. Thank you agin! The guides were entertaining and made sure we were comfortable and safe on our horses. I used your service twice to do both Mystic Mountain and Beach Heritage Horseback ride. Your website is very easy and clear to use...booking and communication were great. Both trips were wonderful experiences and very well organised. Both drivers we had, Sylvan and Orlando were both prompt,informative and first class. A big thank you to all concerned for making our time in Jamaica just that little bit more special. We had a great time on the Beach Heritage Horseback Ride Tour. The staff were funny and really helpful and the horses seemed to be well looked after. Our driver was very professional and patient. We had a wonderful experience booking with Jaital. The tour was great and the driver was really nice. Thanks again. Most exciting part of our vacation in Jamaica! What an incredible experience riding these horses in the ocean and woods! Well maintained and cared for. My friend and I had a wonderful time the whole day. Our driver was very friendly and accomodating. Everything we wanted to do, he made possible for us. The horseback ride was enjoyable and our guide was very friendly and worked with us on all of our different skill and comfort levels. Dunns River Falls was beautiful of course. Thank you for the experience! Oh my gosh this tour was fun!!! And I\\\'ve found a new love...horseback riding!! This was my first time on horseback and the experience was fantastic! 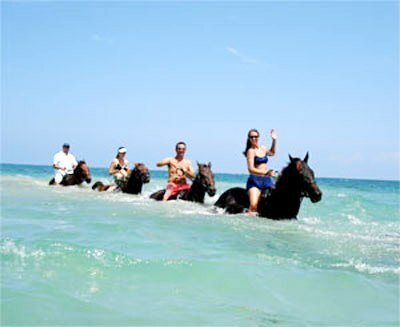 From the slow trot through a plantation to the full speed gallop in the waters of the Caribbean Sea this tour is a must do! I went with kids and even they felt safe and comfortable on their horses thanks to the experience and guidance of our two tour guides! Our Jaital driver (Silvan..hey!! :) was amazing! He picked us up, assisted us with getting prepped to mount the horses and was there waiting for us when we returned! This trip in one word...Incredible!!! 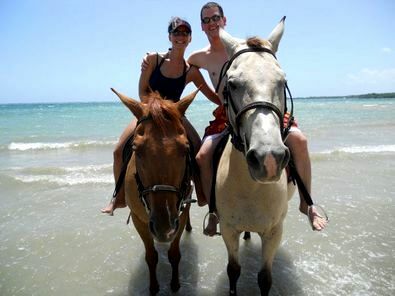 Our beach horseback ride was what we expected \\\'FUN\\\'. We loved the horses and my wife even got her wish of riding her own horse. Everything was perfect from start to finish. Our driver was on time, friendly and very helpful. Our guide at the horseback was patient and provided us with useful information about your country. 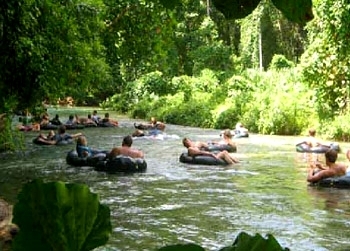 We definitely had fun at the dunns river. we love the falls and would do it over and over again... A day well spent! Thank you! Hello. My wife, friend & I had an excellent time. We were treated very well. Thank u! We thoroughly enjoyed the horseback ride! It was a great experience. The horses were friendly and the guides made it a fantastic day!!! We had an excellent experience with Jaital. Our guides were very pleasant, especially the river tubing guide whose name we unfortunately did not get. The White River is absolutely breathtaking and is one of the top nature sites I’ve encountered. I would recommend the tour to all. Let me start by saying we LOVED our driver! He was so friendly and funny. He kept reassuring us \\\\\\\"no worries\\\\\\\" he was there to make sure we had a good time and enjoyed are short time in Jamaica. Our cruise stop was very short but he got us to our tours and back to the port in plenty of time. Our first stop was the Heritage horseback ride. Desmond and Jim were awesome. Desmond gave us a history lesson but more importantly he was so funny. \\\\\\\"Yea mon\\\\\\\". The beach and swim with the horses exceeded any expectations. It was definitely a highlight and I would recommend it. 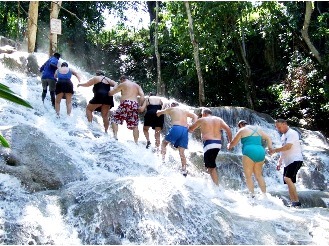 Next we went to Dunns river falls. We chose not to use a guide. My son lead us and it was truly a family bonding experience we will never forget and the falls are beautiful. I forgot to mention that when being dropped off at the falls Our driver noticed I had my wristlets with me. He advised me not to take it because I could lose it in the falls. I was very nervous at first due to it having all my cash, credit cards and sail cards in it. He assured me he was trustworthy and I believed him. I left it with him and when he picked us up he walked right up to me and handed it to me first thing. He made our stop so memorable and stress free I would definitely book with Jaital when and if I am back in Jamaica! Thank you Jaital for making the process so easy! We wish to tell you what an enjoyable time we had our recent trip in Jamaica. 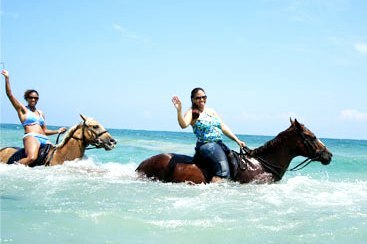 The horseback ride was incredible ---- the experience of seeing the country side and riding in the ocean was great. We also enjoyed the Dunn Fall very much ---- it was refreshing and great fun. Our driver was very pleasant and prompt. Thank you for the experience of visiting Jamaica. Our driver/guide did a terrific job getting us to the horseback riding and the Falls even fitting in a trip to the Wasaii Pottery at our request. once the horses were saddled, the trip was everything we had hoped - just us and one guide - to a deserted beach where we rested, swam a little, collected shells, and rode our horses in the water. Even though there was a huge line at the Falls, Our driver got our tickets fairly quickly. He picked us up even in a pooring rain. We will definitely recommend your company and use you again ourselves. The horseback experience was unbelievable. The two men who were our guides were amazing. I have never been so pleased with an activity of this nature. It was an unbelievably great experience for us. The tubing trip was great too. I only have good things to say about the two experiences. I was not real happy at times with our driver. The guides for the horseback ride were wonderful and we really enjoyed them. The driver was also very good, and he made sure we were taken care of and safe. All around a great experience! Ee had an amazing time while in Jamaica. It was very nice having someone there to pick us up as soon as we got off of the ship. Everyone in our party loved our driver (Silvan) and we really got to know him on a personal level. He made sure that not only we stayed safe, and our stuff stayed safe, but that we always had a great time while there. Anytime we were getting ready to go on an adventure he would give us tips about any and everything. He truly made the experience in Ocho Rios even better than it already was. It was the very first time that our group had ever gone horseback riding, but the group there made us feel like pros. Anytime we were hesitant about something, there was always a guide right beside us making sure we were okay and we knew what to do. I think that this was a great experience, because we got to learn a lot of about the history while also enjoying the horseback ride. I would definitely recommend this to anyone visiting this area and when I come back, I will definitely be booking with your company again! Thank you so much! My experience was pleasent from the start the driver was friendly and courteous from the time he picked us up. when we arrived at the stable the staff was friendly and informative. the horses were cooperative. We were then taken to the falls where the driver walked us to the gate we had a great time and our driver was happily waiting when we were done. The driver asked if we wanted to shop at the market when we stopped. I found the tour to be very proffessional and would highly recommend or use this group again. We had a wonderful time in Jamaica. Our driver was great. He was there when we got off the ship, transported us safely to all our activities. He was funny, charming and enjoyable. We will certainly recommend Jaital to anyone travelling that way in the future. We will be back!!! Our drive make everything work smooth and good advise. Also the guys at the horseback stable where great. They are knowledgeable and seemed to love their work. I am well pleased with the entire trip and would recommend your company. Glad we found you! We had A great experience. Our guide/driver was very good. The guides at horseback ride was great the couple that was with us had small children and they took care of them and help made the kids feel comfortable. Dunns River Fall was great too. Our trip to Ochos Rios was wonderful! Loved it there.I can not be happier than I was on this trip.Our driver was funny,entertaining and when he said he would be there he was there and not 1 minute late.\\ On our horseback riding excursion I was so impressed. Let me tell you that our guide was wonderful.He put us very at ease and gave us alot of local folk lore and how to speak the language.I was nervous at first and he responded to that and with in just a few minutes had my horse and i at ease. The falls were beautifuL! I will definitely be using you again and will recommend your service to others. We had a great time on Beach Horseback Ride My husband and I had done this the previous year and had such a good time , we decided to do the same thing this year with our teenagers and they had a blast!!!! The website was easy to use, the guides and drivers were friendly and very informative about our surroundings. Thank You again for your services.